TheDarkeowl: NOTW 3: Cards Suit You! Here’s another instalment of Nails of the Week! This week I decided to try out a design I came up with myself! It's the playing card suits all in their right colours. There is also an 'A' on my thumb because there are only 4 suits and I have... 5 fingers! 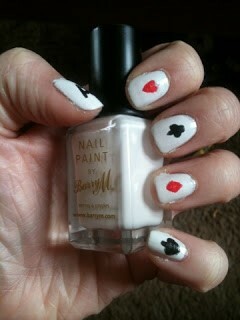 So I used Barry M's 'Matt White' as a base on all of my nails. I think this needs throwing away, as it was starting to get a little bit gloopy... Then for the black suits- and the 'A'- I used Barry M's 'Black' (what an inventive name!..). I used my nail art brushes and a large dotting tool to apply the designs which was surprisingly easy with the right brush. For the red suits I used a Miss Sporty polish but I can't seem to find the name. Sorry! It was just a basic bright red anyway so any of those will work. I'm so happy with the end result and they lasted for a really long time on the nails with a top coat (I just used a cheap clear top coat). I got a lot of compliments on them and I think they're great for just a fun look! I think I will almost definitely do these in the future!